Power BI app workspaces are great places to collaborate with your colleagues on dashboards, reports, and datasets to create apps. Collaboration doesn’t end with workspaces in Power BI. Office 365 offers other group services such as sharing files on OneDrive for Business, conversations in Exchange, shared calendar and tasks, and so on. Read more about groups in Office 365. App workspaces are only available with a Power BI Pro license. 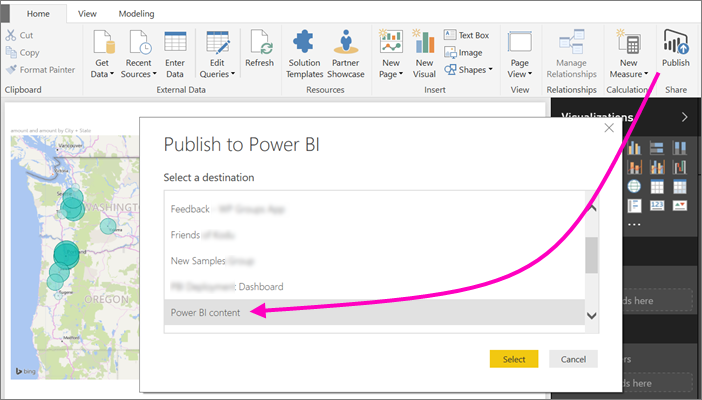 After you create a Power BI Desktop file, if you publish it to your Power BI app workspace, then everyone in your workspace can collaborate on it. In Power BI Desktop, select Publish on the Home ribbon, then in the Select a destination box, select your app workspace. 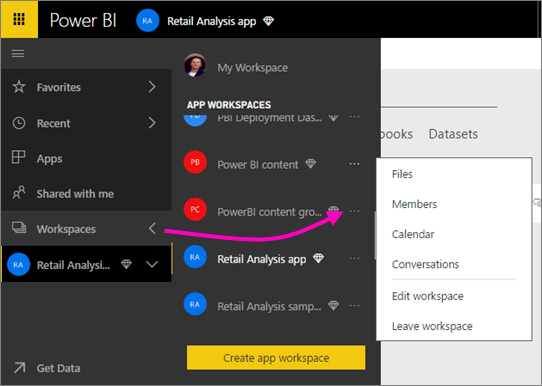 In the Power BI service, select the arrow next to Workspaces > select your app workspace. Select the Reports tab, then select your report. From here, it's like any other report in Power BI. You and others in your app workspace can modify the report and save tiles to a dashboard of your choosing. 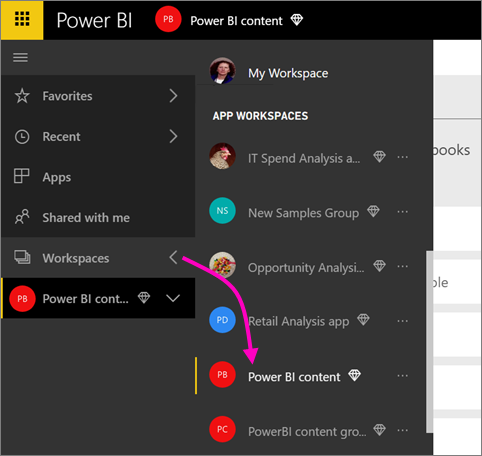 Collaborating in Office 365 starts from the app workspace in Power BI. In the Power BI service, select the arrow next to Workspaces > select the ellipsis (…) next to your workspace name. Have a group conversation in Office 365. Schedule an event on the app's group workspace calendar. The first time you go to your app's group workspace in Office 365, it may take some time. Give it 15 to 30 minutes, then refresh your browser. Select the ellipsis (…) next to your app workspace name > Conversations. The email and conversation site for your app's group workspace opens in Outlook for Office 365. Read more about group conversations in Outlook for Office 365. Select the ellipsis (…) next to your app workspace name > Calendar. This opens the calendar for your app's group workspace in Outlook for Office 365. Read more about group calendars in Outlook in Office 365. If you’re owner or admin for an app workspace, you can also add or remove workspace members. 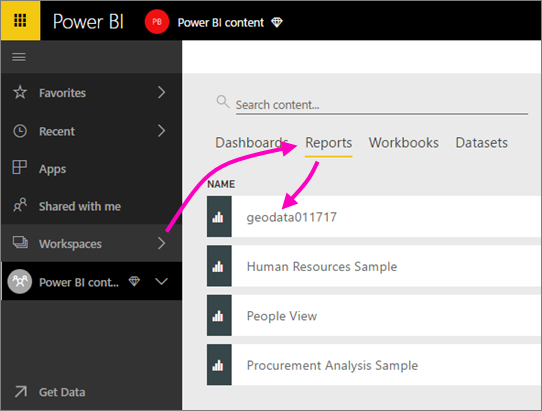 Read more about managing your Power BI app workspace.